No explanation on what the list of people is about – I’m just gonna pretend dumb for a minute – are these the candidates we need to boycott? Are these the good candidates? Are they federal candidates? Are these people, candidates? Are these election officials we can contact to get voting-related help? And despite all the above, it was carefully calibrated with the boxes and the layout to help people reference it when filling out their ballots. 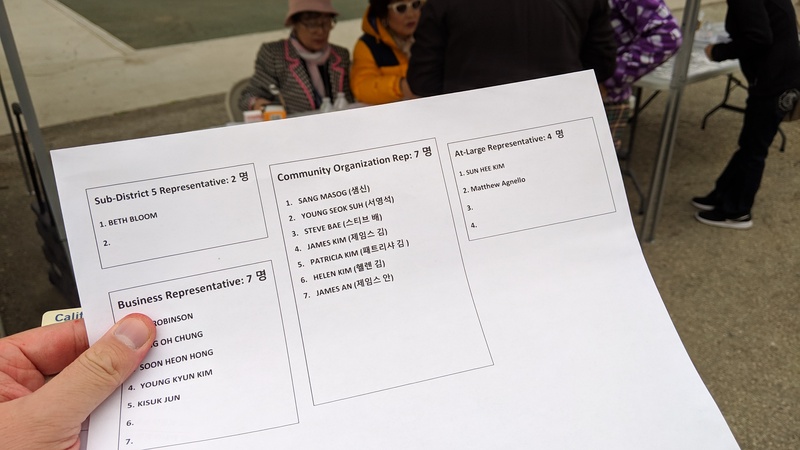 Something else that is interesting – only the 7 people under Community Representatives have their names phonetically spelled out in Korean. At this point I was feeling disgusted, and had no intention to keep talking to this group. I took a few photos, and tweeted it out. When I walked in to the gym and handed in my voter registration form, I still had the candidates paper in my hands, and it slipped in together. The poll worker saw the paper and told me that I should make sure to not leave it behind inside the poll. (since it’s partisan material) So while we were at it, I also asked her about the booth outside. “Did you know that they are passing out voter reg forms and then giving people these candidates list? I thought they were official elections staff at first.” She rolled her eyes and said “yeah, they are not supposed to be doing that”. So your insinuation as it to being something other than what it was intended for is offensive. We did however push a slate, 4 of the candidates are KAFLA board members. We also slated others who were not Korean, but you wouldn't know that because you just passed by and assumed? 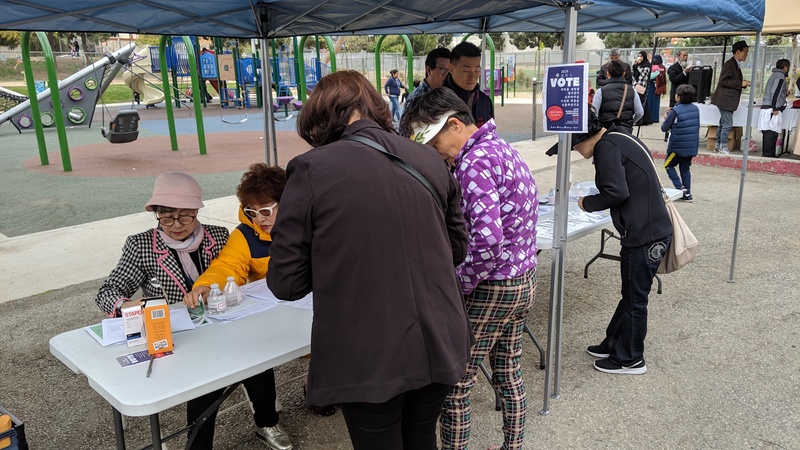 James An, who was one of the candidates, responded on Twitter saying that he was part of this effort, along with four other Korean American Federation (KAFLA) board members. James is most likely winning the election at the top of the subgroup with 350 votes as of today’s partial results. Violation of #1 above, since the booth had official flyers and posters that included a logo – I can’t quite make out the logo from the photos I took, but they seem to be either the city logo or the Department of Neighborhood Empowerment logo. 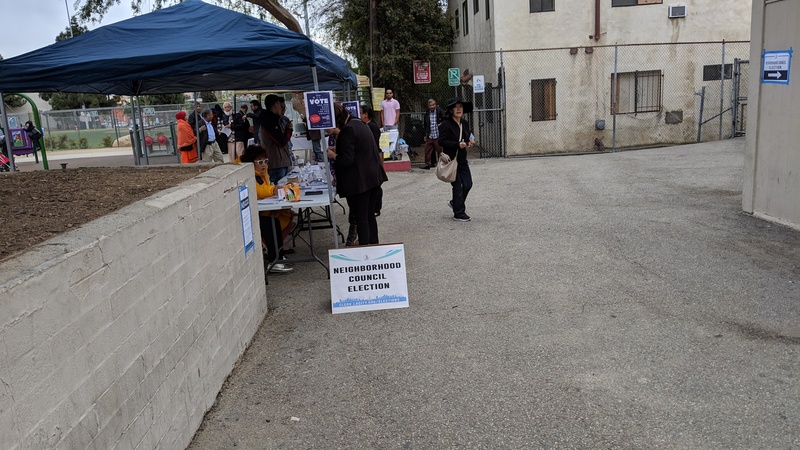 Violation of #2 above – for county and city regulations, the electioneering prohibition usually applies within 100 feet of the entrance door. I’m not sure how it works for NC elections, but hopefully it’s the same. James An also argued that it was more than 100 feet away. We would need to measure that – it felt more like 50-70 feet from the door to me. The above photos should give the exact spot where we need to take the distance. If legal, then the group should have identified themselves, put both the group’s name and contact information on the paper (even an email or Facebook, if phone was not feasible) so that voters could get help throughout election day, and definitely not use official city materials to decorate the booth. If illegal, then the group could have gone all in and stop the pretend-speak of “it’s just for your consideration, we are not telling you to vote for the person”. Just put up photos of the candidates you support. Write “recommended candidates” in the paper. Put up a sign that says “Koreans let’s unite and win” in the booth. There are so many ways to make your illegal campaign much more effective. I wonder if this wishy-washy behavior is indicative of a subsection of a larger group taking action on their own without approval. So maybe it’s a group of people within another group, that wanted to do this, but were not quite convinced? Also, was this booth some form of KAFLA effort? KAFLA is a nonprofit organization defined by IRS code 501(c)(3). 501c3 nonprofitss are not allowed to endorse (non-deep link) or carry activities that will benefit one or more candidates over the others. This whole approach reminds me of how Korea Daily handles elections. Candidate endorsement is a tricky subject, because in Korea, it is illegal for newspapers to endorse candidates because they need to report fairly. The prohibition didn’t mean that newspapers in Korea would stop displaying biases and use every means they could to give an advantage to the candidate they support. All those tricks and nimble maneuvers of the trade they learned in Korea is in full display in the U.S. Korea Daily. I’m not sure what the need for the masquerading is, when Korea Daily’s politics section chief is an unapologetic Trump supporter who still writes articles about Hillary’s emails in 2018 and runs a YouTube show in English and Korean on behalf of Korea Daily to prop up Trump. 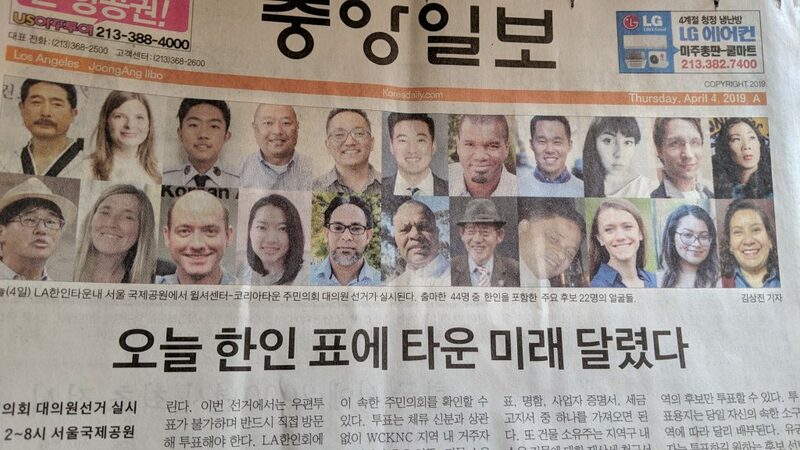 Korea Daily, which self-congratulated itself for driving the opposition to the homeless housing project in Koreatown last year with over 150 biased articles that twisted even sources supportive of homeless housing solutions, is now playing this weird double game where they publish a company editorial pretending to care about homeless people now, while at the same time drumming up turnout to the Neighborhood Council elections under the frame of “this is the Little Bangladesh fight round two”. 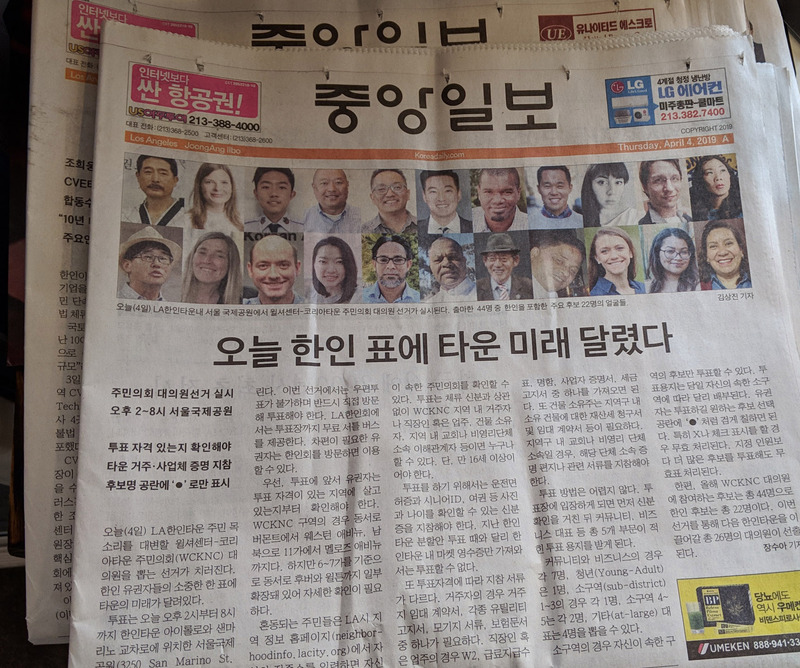 Election Day’s Korea Daily front page upper fold article shows 22 candidates, and the photo caption reads “major 22 candidates, including Koreans (out of all 44 candidates)”. So does this mean they included all the Koreans, and then filled the space with randoms? There is no pre-election polls on small elections like neighborhood councils. Is this in any way related to the paper above? If you are going to do actions supporting candidates, please just do that. This whole I-did-it-but-oh-did-I back and forth is so frustrating to watch. Update: a copy of video of the booth, via another Twitter user.